Used to have a great training partner…until he moved. Running solo these days. Somewhere, someone is training harder! I run for fun. I run marathons for the challenge. 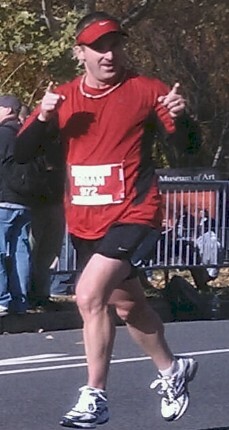 Realizing at mile 22 in Philly 2010 that I had enough in the tank was going get to the finish in a new PR. I crashed and burned in my first marathon by going out way to fast. There were no pacers…and I could have used one. I enjoy helping others settle in to a comfortable pace early on…and pushing them to their goals at the end. Pacing Shamrock 2011 in the 3:20 group. We had large group right through 23-24 miles…several of the stronger runners were encouraged to lead out a little…and the others were brought in with a lot of PR’s and BQ’s. To go 3:29:50…ha ha. Anyone looking to set a PR, BQ, or simply run a 3:30 marathon will have a solid leader. We’ll run slow when you want to run fast in the beginning; and we’ll run fast when you want to run slow at the end. We’ll even splits from start to finish and we all get there! Conserve your energy early on…lot’s people like to talk. 3:30 is a tough pace…some small talk is nice…but conserve, conserve, conserve. Stay relaxed and loose…and you’ll be strong at the finish.